The phenomenon was first spotted by electronics evaluation site Wirecutter on Wednesday, and other sources from social media. it is manifesting from contact with "oiled" wood surfaces and the silicone ring on the bottom of a HomePod. It is not appearing on all wood surfaces. 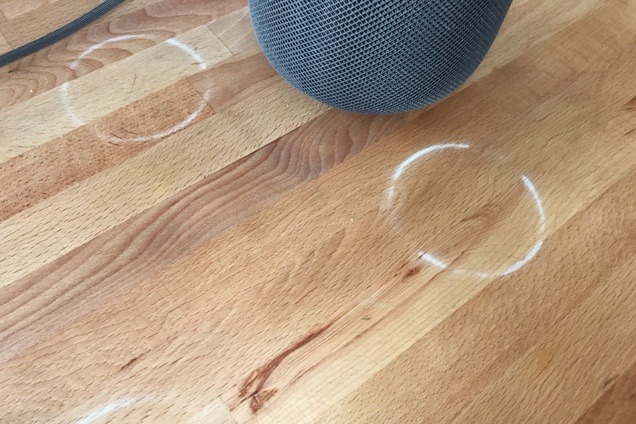 AppleInsider's HomePod used for testing has been in a fixed location on a finished wood surface since Saturday, and no ring has developed. 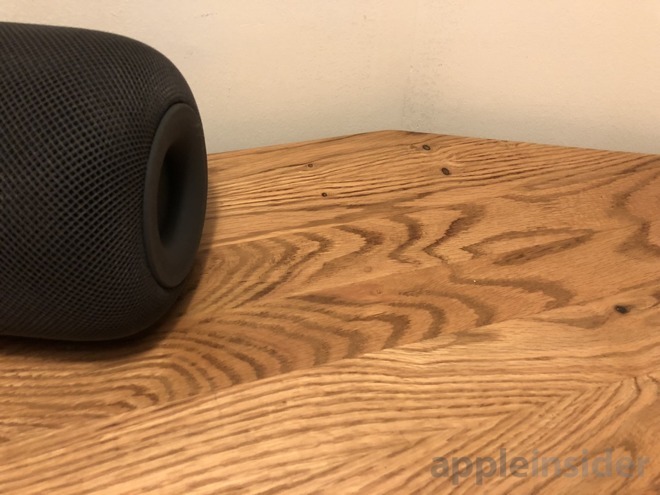 AppleInsider spoke with a few professional woodworkers about the matter, and the consensus between them suggests a reaction between the silicone in the bottom ring of the HomePod, and a different form of silicone common in furniture polishes like Pledge. They called the reaction similar to the "fisheye" that can develop in some furniture as a result of chemical differences between the wood's finish and the polishes. But, other than elevating the HomePod very slightly using a thin non-skid surface, they offered no easy and permanent solution for those suffering from the problem, other than stripping down the furniture, and replacing the finish with one lacking silicone. Apple appears to be aware of the situation, an offers little in the way of advice. In an email to Wirecutter, Apple said that "the marks can improve over several days after the speaker is removed from the wood surface," and "try cleaning the surface with the manufacturer's suggested oiling method." It appears that glass, granite, MDF plywood, polyurethane-sealed wood, and laminate furniture such as that found in Ikea are not affected by the problem —which makes sense if the problem is a reaction between different silicone mixes. Update: Apple has published a support document elaborating on the cause of the issue and recommended steps. "It is not unusual for any speaker with a vibration-dampening silicone base to leave mild marks when placed on some wooden surfaces," the webpage reads. "The marks can be caused by oils diffusing between the silicone base and the table surface, and will often go away after several days when the speaker is removed from the wooden surface. If not, wiping the surface gently with a soft damp or dry cloth may remove the marks. If marks persist, clean the surface with the furniture manufacturer's recommended cleaning process. If you're concerned about this, we recommend placing your HomePod on a different surface."